Last evening, we stumbled online upon this meme that completely cracked us up. 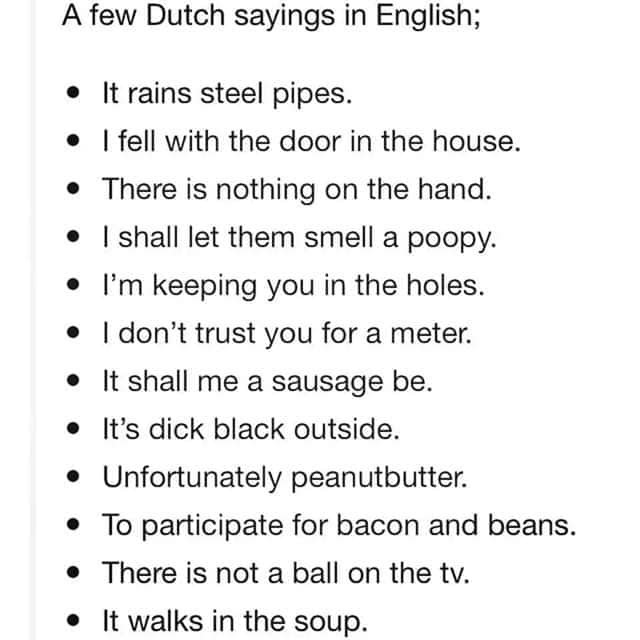 It contains a short list of 12 Dutch (common) expressions, literally translated into English. English: It’s raining cats and dogs. English: I cut to the chase. / I told it as it was. English: There is nothing going on. / Nothing is the matter. English: I will knock them for a loop. / I will show them. English: I’m watching you. / I got my eye on you. English: I don’t trust you for a second. Dutch: Het zal me worst wezen/zijn. (=het maakt voor mij geen enkel verschil). English: I couldn’t care less. English: It’s pitch black outside. English: To participate only for the show. English: There is nothing worth watching on tv. English: It’s failing. / The plan is a complete failure. Learning expressions in a foreign language is not easy and usually requires a certain level of proficiency in that language. However, expressions and idioms offer an amazing insight in the cultural peculiarities and differences that most people who learn a foreign language or live in a foreign country sooner or later will face. If you do not speak the language, learning a couple of expressions can serve as a great conversational lubricant - your Dutch speaking partner will be flattered at best, or make fun of you if you get the expression all mixed up at worst. Either way, you will have a great topic to talk about small cows and calves! (Dutch: Over koetjes en kalfjes praten / English: To have a small talk). If you decide to actually learn the Dutch language or level it up quickly through a series of engaging, relevant and informative Dutch language lessons in Amsterdam, be sure to check out the courses at TaalBoost - Dutch language courses in Amsterdam. Subscribe with your email address and be notified about news and updates. Subscription is free. Your email address will not be shared with a third party, nor will it be sold or used for purposes other than subscription for the newsletter.